Artist explains: The Refugee woman and her Children are fleeing through the Unknown Darkness but God has not abandoned them. The White Line represents God's Light and the Flying Fish is Hope, accompanying them. One hand points to God, the other shows the Way. The Arabic script (Azerbaijan's alphabet until the late 1920s), reads "God is Great". The (red) Sugar Cone, traditionally a gift at weddings, and the Pears symbolize the posessions that the refugees must leave behind (1993, 5' x 5' oil). 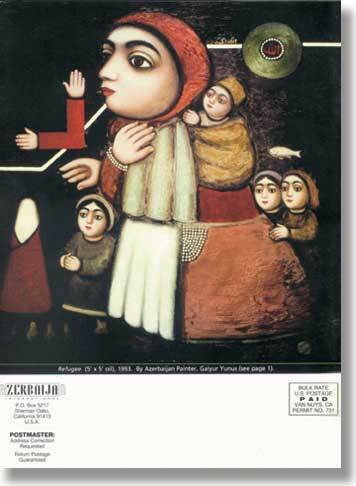 See more art works of Gaiyur Yunus and contact him as well as more than 160 other Azerbaijani artists on AZgallery.org.